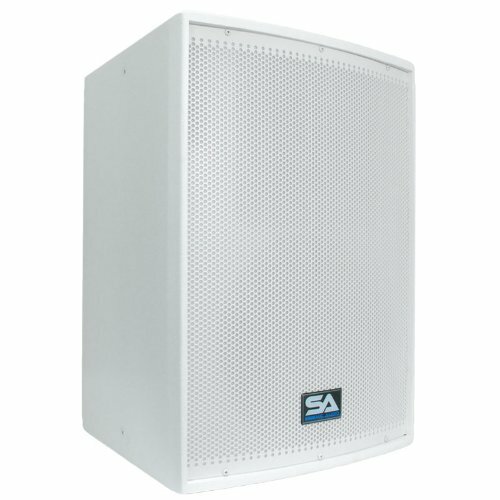 Premium White 12inch PA Speaker or Stage Monitor - Model #: Arctic 12 (Single Speaker), 12inch Woofer, 300 Watts RMS; 600 Watts Peak, Woofer has 75 oz magnet and 3inch caption voice coil, 1 3/8inch Titanium driver tweeter with 10 oz. magnet and 1inch throat, Two 1/4inch inputs and two Speak on inputs, Frequency Response: 49Hz to 20kHz, Crossover: 12/18db per octave 3Khz high power w/ dual glass bulb tweeter, Impedance: 8 Ohms, Sensitivity: 97 +/-3 db, Max SPL: 119 db continuous - 122 db peak, 1 3/8inch tripod speaker mount on bottom, Ported Enclosure, Full metal white grill, Recessed Handles, Textured White painted finish, Lewd: 25inchx18inchx17inch, 41.5 lbs per cabinet, Condition: New, One Year Warranty. These amazing 12 inch Premium White Speaker Cabinets deliver every sound loud and clear with a 12 inch woofer, 1 3/8inch titanium driver, a frequency response of 49Hz to 20,000Hz, and 300 watts RMS, 600 watts peak power. The Arctic series was design due to numerous request for a Church speaker that could camouflage in a sanctuary and still sound amazingly good! These cabinets are solid white and can be mounted on a speaker stand or used as a stage monitor. We have also incorporated fly point connectors in three different areas of the cabinet. You can hang these from the ceiling from the top or either side. Fly hardware is included with each cabinet for easy hanging. Great quality mains are very hard to find, especially at a decent price. The Seismic Audio brand was designed to make the professional musician, as well as the musician low on cash, sound great.